Focused on offering an opportunity for every student to have access to better learning experiences, this initiative aims to help students secure a better, more promising future. Students can experience and learn from a whole range of math and science videos across grades through their month-long free access to the learning app. This initiative aims at making quality education accessible to students irrespective of their geographical locations. How to get free access to BYJU’S The Learning App? 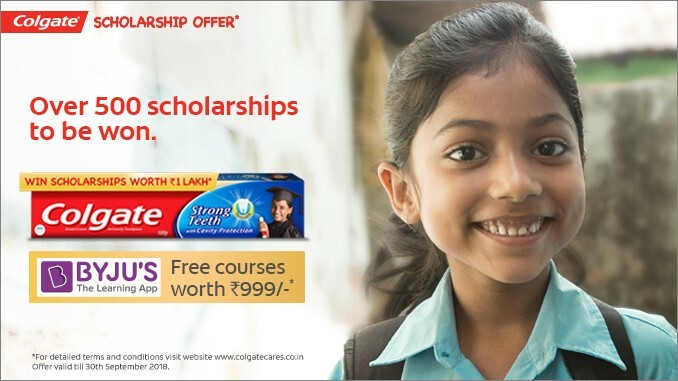 Every Colgate oral care pack of 50g and above will have a BYJU’S Coupon Code listed on them. Users can download the app and use the coupon code to activate the course for their class, completely free, for a period of 30 days. The new version of BYJU’S App has a guided path for personalized learning. Every chapter is broken down into smaller learning journeys (subtopic). It has been created to prepare a perfect learning experience for children where the learning journeys are defined through video module, in-video questions, games, and quizzes. BYJU’S is the largest K-12 app in India with over 15 million students on its platform. Since 2011, BYJU’S has been inspiring students across geographies to fall in love with learning, by bringing to them well researched, engaging & interactive learning programs. With guided learning paths, active and actionable feedback mechanism, the learning app is paving the way for new-age, geography-agnostic learning tools that sit at the cross-section of mobile, interactive content and adaptive learning methodologies.